Launch VoiceOver by pressing Command, F5 on your keyboard. Once VoiceOver is running, press Command, Option, M three times to select the Spotlight search field. Enter your search term and press Return. Spotlight will announce the number of items found and the number of items currently displayed in the Spotlight search results pane. Use the Up and Down Arrow keys on your keyboard to navigate the search results. 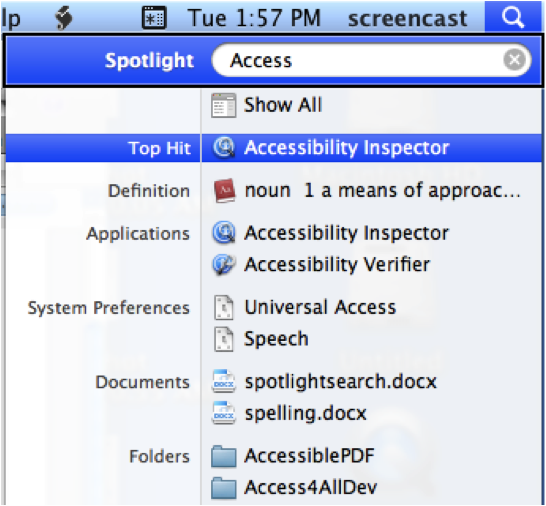 As Spotlight reads each result, it will announce the name of the item (file name, folder name, application name, etc.) and the category it belongs to (Applications, Documents, Folders, Images, etc.). To open a search result, press Return while that item is selected in the Spotlight search results pane.